At least once a year it has become our custom to take a book of the Bible that either we may not read very often or that may raise more questions than we have answers and tackle it together. During the early part of autumn we will be looking at the book of Judges. It’s a raw, at times vicious, account of a nation hurtling into darkness. Along the way God raises up judges to lead the nation, but one by one they seem to drift further away from God’s heart for his people. We know them by name and we know their general stories: Deborah – a strong woman leader which at the time must have been so unusual, Gideon’s desire not to be a leader, Samson’s mighty strength. But there are other less well known stories: Jephthah whose power of speech gets him into all kinds of trouble, tales of kings being killed when they have gone to the toilet, horrific rapes and revenge attacks. Sometimes you want to ask, what are stories like these doing in the Bible and how are we to make sense of them? Well, that’s what we will be doing together. You might want to have a dip into the book before we begin on Sunday 11 September. On this weekend we will be going away again as a church to Cefn Lea, mid Wales. The adult sessions will be structured around the three first words we are taught as young children and that are the most basic words we ever say to God. Our prayer is that this weekend will be a turning point for many of us. To all those who are going we will send out a timetable beforehand. But please remember to bring, sheets (or a sleeping bag), pillow cases and a towel. For those who are not able to come along, please note there will be NO service on Sunday 25 September. If you still haven’t paid, please see Jo Northall as soon as possible. If you will have spare seats in your car and are willing to take others, also let Jo know. Every month, we have the chance to come together in church to pray or worship or explore the Bible together with greater time, in ways that we don’t have on Sundays. The next will be on Wednesday 21 September at 7.30pm in the church, when Neil will be delving deeper into the issues relating to the book of Judges. We are proposing running a set of ‘Going Deeper’ workshops this academic year. The first will be for 4 weeks, beginning on Thursday 17 November through to Thursday 8 December. We will look at issues like, ‘How can you be sure the Bible is trustworthy’, ‘How did the Bible get to us?’ ‘How do we interpret it?’, How do you grow in confidence as a reader?’, How do you make sense of stories such as Adam and Eve, the Flood, Jonah and the Whale, the miracles, sections like the Law or the vision books like Daniel and Revelation. Each session will have some input and then time for discussion and exercises together. We want to know that there will be enough interest in this to make it worth running, so if you are interested in coming to the set of 4 evenings, please see Neil or Ian. 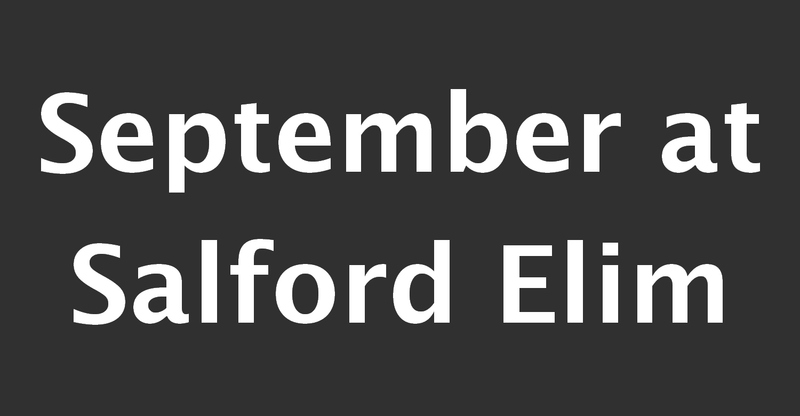 Want to know what else is going on at Salford Elim Church? Download our newsletter.